Oh jeepers, everything is on fire! Or we’re in H-E-Double-Hockeysticks? 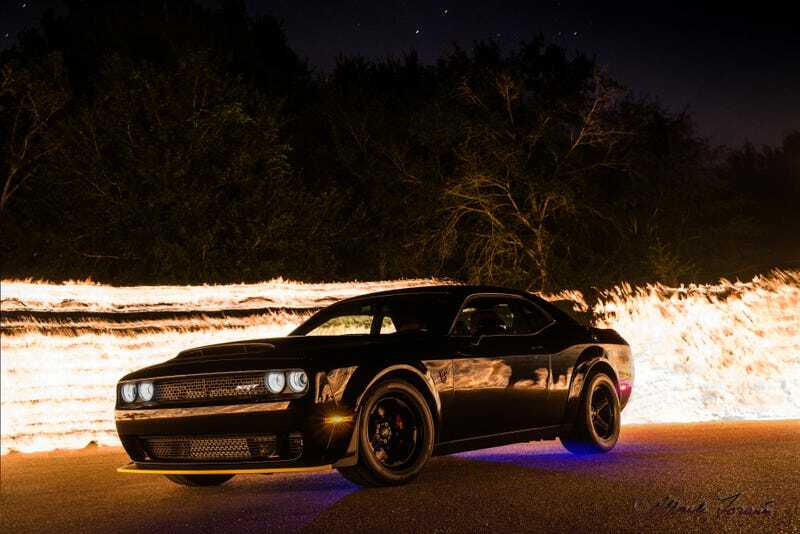 The Demon is quick enough and indulgent enough to get you there. It’s prideful and greedy, you lust over it, it definitely carries a whole lot of wrath under the hood. It’s hard to call a car that runs the quarter in under ten seconds slothful, but at 4300 pounds, it might be apt. I doubt you’ll be envious of much in this supercharged supercoupe, but you might create a lot of envy in others. So that’s all seven cardinal sins wrapped up in one car. This sin-filled fire-painted photo comes to us from Mark Louvier. You can check out more of his work on his website, marklouvier.com, or on Instagram: @marklouvier.